Merry Christmas! Sorry it is late, but better late than never. We had a wonderful, but busy, Christmas. It was so nice to be with almost all of our family. Billie had a wonderful time, of course. Her favorite gift was her new bike. Now she will not hit her knees on the handle bars when she tries to pedal, hehe! That really made riding hard for her, go figure. She got wonderful baby dolls that she has been busy taking care of the last few days, too. She loves baby dolls just like I did when I was little, and they keep her busy for hours. She especially likes to wrap them in blankets and take them when we run errands or go somewhere. It is so cute. She is going to be an exceptional Mommy one day... a long, long time from now. She loves real babies, too, and is so good and careful with them. She wishes still so bad for a baby brother or sister. We always tell her it has to be in God's time. She usually says something like "OH! But I have been waiting soooo long!" It is so sweet, she will be an excellent big sister. She is enjoying her winter break. We are going to take her to a movie tonight, she is very excited. She absolutely loves movies, and especially getting to see them at the theater. Christmas was wonderful, but it was hard, too. 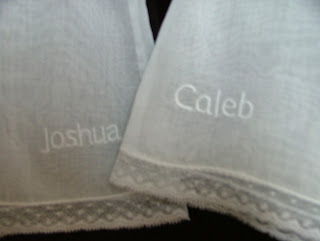 We couldn't help but think about Joshua and Caleb and how this would have been our first Christmas with them. I guess they still had their first Christmas, but in a totally different way that I know I can not even imagine. I know it was beautiful and spectacular and fantastic, though. We did miss them so much. We managed to include them in little and big ways, through special gifts for our family and each other that included pictures of them. We made special ornaments with their pictures in them and hung them on our tree. We had a little tiny tree in their room and we made picture ornaments for that tree, too. We had a total of three for that tree, and each had a picture of one of us kissing the boys. It turned out very cute, and made us feel closer to them. We also took a photo album that I made for Matt for Christmas with all of the pictures from our photographer in it around with us to each house we visited that day and shared that with everyone. All of those things helped us feel closer to them. We also went to the cemetery and visited Michael and the boys on Christmas morning. There are always a lot of people at the cemetery on Christmas, so I guess that wasn't too weird. We have done that every year since Michael died, so it seems very normal to Billie. Enough of that sad stuff. I hope everyone has a very safe and happy New Year's celebration. We are planning on sharing it together playing Wii and just having a good, fun and relaxing time. Billie and I have become very much addicted to the Wii. It is so much fun to play together. I will embarrassingly admit that my favorite game is American Idol. I know everyone is laughing at me, and that's OK. Billie and I just sing at the top of our lungs and belt those songs out! I am sure our neighbor is looking for a good realtor. Matt hooked it up to the surround sound this weekend, but I have been sick and haven't tried it yet. I am sure all of you will be able to hear it when I do. I think that catches everyone up for now. I have to get started on dinner so we can make our movie! Love to you all! How many children do you have? I HATE this question. When I am asked this question, I struggle every single time with how to answer. Most people that ask me this question have a reason, and it is not to get to know me and gather information about my life situation. It is either to give me a children's menu at a restaurant, or maybe to decide if I have the same struggles in my daily life that they have in theirs. I have talked about this over the last couple of days with some of my friends, out of guilt and just to see their opinion, but I still have the same question in my own head as to how to answer. I went to Billie's class Wednesday for her Christmas Party. I was talking with another Mom and we had a lot in common. She is also a full-time student, and a mom and a wife and she was telling me how hard it is and how especially at Christmas it is hard to buy for all 3 of her children. Then she asked me if I just had the one, and I hesitated. I didn't know what to say. Instinctively what came to my mind was "No, I have three." But she wasn't asking me how many children I have had, how many children I love with all of my heart, how many children spent 9 months in my belly and captured my heart the moment I found out about them. She was asking me how many children I have to feed dinner to, how many children I have to get up and get ready in the morning, how many children I have to buy Christmas presents for. So as I struggled with my own thoughts, she asked me "Do you just have Billie?" I think she must have thought I didn't understand her first question. I answered "yes." and then as she continued to vent about her struggles with 3, I barely could listen as I thought "NO! I have three children. I said only one, but I really have three! I feel so guilty that I said that to you, and I want to go back in time and fix it. I am so proud of all of my children, and I don't want you to think that I am not." I could think of nothing else the rest of the time I was there. I never went back to her and corrected myself, because it was not the appropriate place or time to get into a huge discussion and explanation of the past year of my life. And she was not asking me the question that I wanted to give the answer to. I find myself feeling so guilty if I don't tell people about Joshua and Caleb because I am afraid the boys would feel like I am embarrassed or ashamed of them. I am so proud of them, and I see them so beautiful and perfect just the way they were. If they were alive today, I would take them everywhere, although I know I would worry that they wouldn't be safe in the car since they wouldn't fit in a car seat. I would worry about how Billie would feel if someone asked a stupid question or laughed or pointed or something. But I would proudly show them off and take them everywhere, just like you would with any twin babies! I know that question will be asked of me a lot and I will have to get over my guilt with how I answer it. But in my heart I have three children. I am so thankful to God that he gave us Joshua and Caleb and they are a big part of our family and they always will be. I would love to be celebrating this as their first Christmas, but I am also thankful to God for the way He handled their lives and the way He stayed with us and carried us through His plan. When I let myself day dream about what it would have been if they had lived longer, God always shows me that eventually it would have been harder as they suffered and I had to let them go anyway. God is good and He knew what we could handle and what we could not bear and He protected us from that. I have so many things to thank God for in my life: my family, my husband, my daughter, my sons, His son he sent for me, a roof and hot food, wonderful friends, presents under our Christmas Tree. I could literally take two days listing everything I need to be thankful for. But today I want to share with you the most wonderful experience I had. I "met" a dear friend today, over the phone but I bonded with her so strongly. Vanessa Delgado, who I already loved dearly but now consider her one of my dearest friends. Her twin girls, I mentioned them in an earlier blog, Melody and Madison, born on November 11, they were conjoined similiarly to Joshua and Caleb and lived for about the same amount of time, too. I finally talked to her on the phone today, after some emails back and forth over some time. I was trying to wait to call her until I felt strong enough. I have been very sad over the last few days, the holidays are just hard, and I didn't want to cry and be all "moosh" when I talked to her. I wanted to bring her comfort; you know, say the right thing and somehow fix her pain. Like anything I could ever say would do that! HA! Who was I trying to fool? I have no idea, but I finally could wait no longer. And then we got a package in the mail from them! It was amazing, it included a wonderful gift for Billie that she LOVED, and an ornament for us that wasn't meant to look like Joshua and Caleb and Melody and Madison but it SOOOOO does! Her 2 year old daughter, Kenya, found it at the store and she said to them that it was Melody and Madison and "look they stuck together!" Could that be any sweeter? And they are, and they "share" a heart. Ok, the company that made them never meant for us to take it that way, but she did and we do and it is the most perfect thing for our tree. We so wanted an ornament for this year for the boys, and now we have it. We didn't want "Baby's First Christmas" because it isn't. Although, I bet they will have some crazy fun birthday party in Heaven! I know we may celebrate on a different day then it really was, but you know what I mean! Still, if we are all celebrating the birth of Jesus Christ on the same day here on Earth, don't you think that forces Heaven to feel warm and happy and want to party right along with us? So, as Matt said, here they are comforting us and sending us gifts when they are closer to their pain than we are (meaning we are 5 months out and they are only 6 weeks out.) We were floored by their kindness, support, love- everything that we should have been doing for them and here they were doing it for us instead. That is amazing. So.... I called Vanessa today. We talked for about 2 1/2 hours, and it wasn't enough! I could have talked to her all day and night and still found more stuff to talk to her about. We have basically been through the same experience. It is just amazing. Some of the things that really bother me, bother her, too! And some of the things I feel guilty about, or second guess, she does, too! It was just an amazing time for me, and I know it was for her, too. And when I told Matt all about it, he asked me when we were going to visit them. So, he feels it, too, even through me. I just have to be thankful to God for bringing us together and giving us someone that can totally understand where we have been and where we are now. They are such strong, wonderfully faithful people, too. I am so glad they can appreciate our desire to do the will of God and to glorify God through our lifes and through the birth and deaths of our children. Not that so many of my friends and family do not understand and support that, but Vanessa also feels it with me, too. SO don't any of my wonderful family and friends get your feelings hurt by all that I am saying! I still need you and am so thankful to God for you, too! Ok, so I am going to stop now going on and on about this, but I just wanted you to know what an amazing experience this is and how excited I am to get to know her and her family more. I haven't been good about keeping my blog update, and I am sorry about it...again! I guess I get to a place where I don't even want to share, plus we are so busy all of the time. I know everyone is busy and you all take time out of your day to stop here and see if I have updated, so I promise I want to update more often. Maybe I can make that a New Year's Resolution! HEHE!! Because those always work out, right? Billie had her piano recital last week. It was wonderful! I am going to try to load the video up here for you all to see. I am not technically savvy, and it scares me to have such a big responsiblity, but I really want you all to see what a natural entertainer she is! She has such stage presence, she does not get nervous at all. She actually looks forward to perfoming on stage! It is so opposite of how I was as a child! I was so scared and shy, I wouldn't even try out for things because I was just too scared to get in front of people, even though I loved to sing and dance. I always had regret about that, even as a child, but my shyness and fear were greater than any regret I felt. She wants the lead in the play, she asks me if they get to have more than one recital this year for dance because she can not wait to get on that stage and perform. She is good, too. Like I said, I will upload it as soon as I figure out how and you can see for yourself how tallented and gifted she is. I know she is mine, but I think I am not too far off here! We are getting ready for Christmas, just about finsished. We are having two different breakfasts here at our house, one on Christmas Eve for Matt's family and one Christmas morning for my mom and Danny. We are very excited for that. It is so fun to have our family around, and to do something nice for them. And then later on Christmas day we will go to Bill and Wanda's and spend Christmas with them, too. We are looking forward to that, too. We also get to visit with Kellee and Greg on Christmas Eve night after church. Billie absolutely LOVES Courtney and Mackenzie, so that will also be a wonderful evening. We are so blessed to have such a wonderful family and extended family and spending time with them is all that I want for Christmas. I wish we could transplant our family that is far away in Michigan, California, Florida and Virginia here for Christmas, but a phone call will help them not feel so far away. I know I have been lengthy with my update today, sorry! I will be back soon with the video of Billie's piano recital, so check back! Love to you all, and thank you for your continued support. We Met Yvonne Last Night! I am so excited, I couldn't even sleep last night. We went to the Fantasy of Tree's Gala, and had a wonderful time. As we were exiting the Merry-Go-Round, and wonderful thing happened. A precious woman stopped us and pulled us off to the side. I could tell she felt a little uncomfortable, but she forged ahead. She stumbled over her introduction for a second, and finally got out that she helped our boys when they were born! OH, the emotions that immediately bubbled to the surface. It was Yvonne, Caleb's respiratory therapist. You can see her in the picture to the right here, she is in red and standing right behind me. She gave us beautiful details last night, details about our boys we had never heard before! She said when they first got them they were breathing on their own, they were doing good. She said they "pinked up" real good, and she wishes we had seen them that way. We do too! They were squirming and moving around! They did not cry, though. She said they started working on them almost immediately, but they were doing good the whole time. She said her and Nikki kind of had a contest with the boys, and cheered on their oxygen stats. It was after they gave the boys surfactant that they started to decline and they came and got us. It was Yvonne that put the boys on my chest! Amazing to have that detail, let me just tell you. She said usually it is a nurse and not a respiratory therapist that does that, but she wanted to do it so she just did it. She gave me my boys! Do you know how close I feel to her?! You only hold your children for the first time once. And she handed me my beautiful boys. I won't say it isn't hard to know that they were moving more and breathing and we missed that and we didn't get to spend that time with them. But at the same time, it is really not something I can put into words as to how good I feel having some of those details that I didn't have before. Yvonne said it was so hard for her to approach us last night, and I can't imagine! But I am so thankful that she did. She made our night. I wanted so bad to run into someone from the hospital, and I can't think of anyone I would have wanted to see more than Yvonne. Now we need to sit down with Nikki, Joshua's respiratory therapist and hear about her time with him. We hope to do that very soon. Thank you so much, Yvonne. Thank you for telling us and talking to us last night, but especially thank you for taking good care of Caleb. Thank you for loving him and giving him everything he needed. I am sure he watches out for you from Heaven, you being his guardian angel here on earth! You will always hold a dear place in our hearts. We will always remember you when we think of Caleb. Matt is already busy working on the turkey. Billie and I are going to make deviled eggs and plant tulip bulbs today. We should have a wonderful time. She is a good helper, and is always so happy about it! She loves to help me with the deviled eggs. I have no idea why she enjoys that so much, but she always asks me to let her help! I hope you all have a wonderful day today, and a wonderful Thanksgiving tomorrow. I am even more Thankful today for my many blessings than I was yesterday! I surprised you with two blogs in one week, will there be three?! You never know! Hello! Sorry it has been so long since I blogged, again. And sorry that you may have been having trouble accessing the website, for some reason we have been having some problems with it. Matt is taking care of the issues, and hopefully it won't happen again. We had an exciting weekend last weekend. 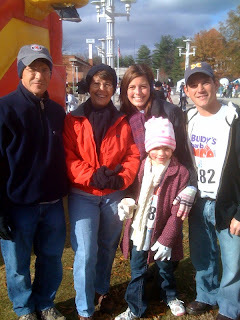 The Buddy's Race Against Cancer was on the 16th, and we had a team again this year in memory of Michael. We had a great turn out, especially considering it was FREEZING! 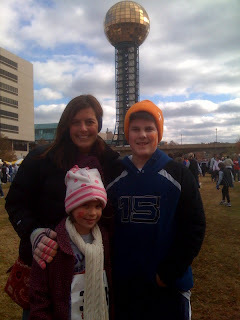 The pictures here are of us and Matt's parents, Billie and her face painting, and us with Riley. We only took a couple pictures, but there were lots more friends and family there, we just didn't take their picture! Matt and I had been so sick, so we chickened out of the 5k walk, and ended up walking in the Walk in the Park instead. It was a good thing, since we both ended up relapsing and getting sick all over again last week. I took another z-pac and am finally doing better, but the cough just won't go away and we are still not 100%. It is so frustrating. The biggest blessing has been that Billie has not gotten it, any of it! That is a miracle all in itself, if you ask me. Anyway, the race was so much fun, I love getting together with everyone and spending the day honoring Michael's memory. It was a hard day, I have to admit I am guilty of having a pity party a couple of times that day. I was feeling sorry not only for myself and my losses, but for Billie's, too. The race and the reason we are there does put it in your face a little more than other situations. But I kicked myself in the bottom and told myself I am so blessed to have had two amazing and loving husbands, some people never even get one man to love them the way Michael and Matt love me. 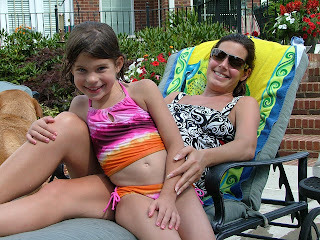 And I have the most amazing daughter in the world. 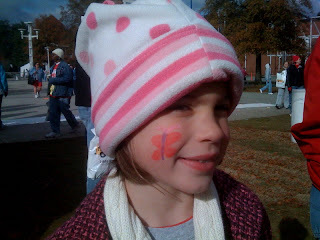 She is so very special, she had a wonderful time at the race. We try to turn Michael's death into something positive by helping raise money to raise awareness, and Billie is beginning to understand some of that. I know she feels good about herself that she is fighting cancer so others do not have to lose their Daddy, too. She looks forward to the Race Against Cancer every year, and I know she will always be a part of it and I am proud of her and her giving heart. She is just the most amazing person, she just handles everything so well. She doesn't sit around and feel sorry for herself, at all, I don't even think the thought crosses her mind to even feel sorry for herself ever. She has wonderful people all around her that love her completely and she probably has more love and support than most kids get. And you can tell by how she handles herself in every situation. I know she is mine, and I am a little biased, but it really is true. I am not sure if I have ever mentioned this story here before or not, but just to show you how amazing she handles herself, I want to share it with you now. When we go to stores and stuff, Billie usually gets a lot of attention from the people working there, as most children do, I am sure. The last time we went to the post office the man working there was very sweet and playful with her. He asked her if she had any brothers and sisters, and she did not miss a beat. She said " I have two brothers." And he then asked her if she was in the middle. She looked at him with surprise, and I could see her little mind just working. It was so cute. She was trying to think of a way to answer, she didn't know he meant birth order. She finally answered as he was also trying to explain himself, I guess he realized she didn't understand his question. She simply said " How could I be in the middle? They are conjoined twins." But he didn't hear her, because he was talking at the same time. All he heard was they are twins. So he asked if they are older or younger than her, and she answered younger. And he asked if they would let her fix their hair, it happened to be crazy hair day so he was having fun with her hair. She told him, "No, probably not." And we were finished and we said our good byes. When we got in the car she told me that she didn't know what he meant, she thought for a second that he did know they were conjoined twins and he was teasing with her. But she was happy as could be and it didn't bother her at all. We did talk about the boys on the way home that day. Just because it got her thinking, she was sharing some of her thoughts that she has had about the boys. She asked me if I thought people would have stared at them. I told her that some people would have stared at them, and that most people would be curious but once we welcomed them and their questions we would just make more friends and that it would mostly be a wonderful experience. She said she wished it could have happened that way, but she is still glad they are with Jesus. She is just amazing and she makes me so proud every single day. 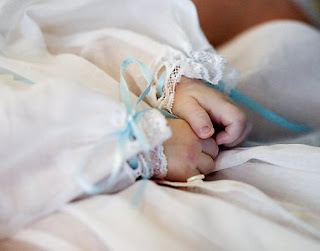 I learned some sad news this weekend, the Delgado's had their twins, Melodie and Madison on November 11Th. If you do not know about them, you can check out their blog at http://www.goodtimesdelgadostyle.blogspot.com/. Vanessa visited our website some time ago, and we have been praying for them ever since. They were conjoined similar to Joshua and Caleb, and they lived only an hour. I know what they are going through right now, and it breaks my heart for them. They seem to have a wonderful faith in God, and I know He will see them through, but please pray for them, Jason and Vanessa and their daughter Kenya and Vanessa's sister that is 15 that lives with them, Destinee. I know all of the prayers that have been sent up for us is what got us through those really hard days, and continues to do so. It has only been 4 months, but I can say that time does help. It is still hard some days, but the wonderful memories of holding our boys and the thoughts of them and how perfect they are today with Jesus fills most of my time these days, instead of the sad thoughts. I had a dream last night that I was still pregnant with them, and I felt them kick! It was so real and amazing, and it woke me up and I can still remember what it felt like. I would probably give my right arm to have them there in my belly, all safe and snug again. But at the same time, I would not take them from Jesus, either. I will get to hold them again one day when I join them in heaven, until then I will be happy with my memories. I wonder sometimes if they will grow up in heaven. Do they stay an hour and a half old? If I die when I am 80 and they would be 45, when I arrive in heaven will I have 45 year old sons that are bigger than me or will I have tiny little babies, only an hour and a half old that I can cradle in my arms? And of course I wonder if they will be conjoined or separated. I just can't decide! I look at their pictures and they look so beautiful and perfect to me, so I am sure God sees them even more perfect than I do, since he created them and all. So, as long as they are happy maybe they are still conjoined. Or maybe they are sometimes and they are not sometimes. I just know in that dream that I had where I could hear Caleb's thoughts, he didn't really know they were conjoined but he had this over-powering desire to be with Joshua all the time. So maybe that is how it is. Or maybe that is just how my crazy mind works! Scary, isn't it? So we are getting ready for Thanksgiving, and we are all very excited it is this week. Tuesday night we get to go to the Fantasy of Trees Gala, thanks to Bill and Wanda for the tickets! We will get all dressed up, and Billie is going, too. She has been before, but doesn't remember. She is excited for it. She loves Christmas and all the lights and decorations, she is going to have a blast with all of those trees! 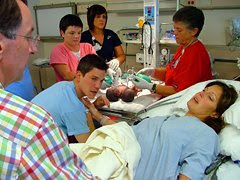 I hope we run into our doctors from NICU at Children's while we are there, since it is a benefit for Children's Hospital. It would be wonderful to see them again. They were so good to us, through the entire process and especially the day the boys were born. I know they did everything in their power to try to help the boys, and we are so grateful to them for all they did. I am taking an exam Tuesday, so wish me luck. Matt is smoking a turkey on Wednesday. And of course I will go shopping with Elizabeth on Friday! Only day of the year that crowds don't bother me. I am so excited! It is one of my most favorite things that happen all year. We have so much fun shopping together. We don't even buy that much, but it is just fun to get that one amazing deal! That door stopper that everyone wants! I guess that brings you up to speed on all that is going on here. Maybe I will surprise you and blog again later in the week! If not, I hope you all have a wonderful Thanksgiving. I have so much to be thankful for this year, it will be hard to list them all, but I will make it a point to count all of my blessings and thank God for all the good he has done in my life. Crazy Hair Day, Soccer, Halloween and a Dream! We have had an exciting few days. Friday night was Halloween, of course. 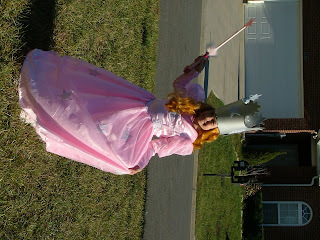 Billie dressed as Glinda the good witch from the "Wizard of Oz." She was so cute. Her Grandma Rosecrance made her dress for her, and it was so perfect. We had petros and went trick - or -treating with Ya-Ya and Papou. Ok, so the picture here is sideways, I will fix it and post another one later, but I wanted to get it on here for you to see! 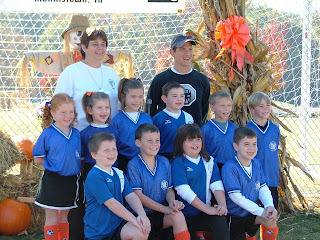 Then on Saturday, we went to Morristown for a soccer tournament. Unfortunately, we lost all three games. But the kids had a good time, and it was a good learning experience for them. It was fun to be with the great kids and parents of our team for one last time this season. The tournament marked the end of the season, so we won't all be together again until the spring, except for a Celebration party on Saturday for the kids to get their trophies. 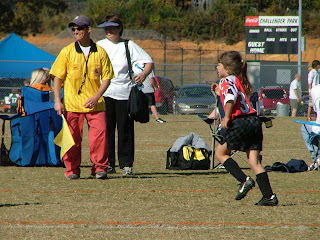 I posted some pictures here of Billie and her team, and of Matt as a referee. Billie is number 26. Matt not only volunteered to be assistant coach again this season, but he also volunteered to be a referee. So he spent a lot of time on soccer this season just so Billie would be able to play, and we appreciate it so much. He enjoys being with the kids, but he went way above and beyond this season. This week at school is spirit week. Monday was PJ day, and Billie wore her PJ's to school! She always enjoys that. Yesterday she was off for election day, but she went to the school with Matt and I as we casted our votes. 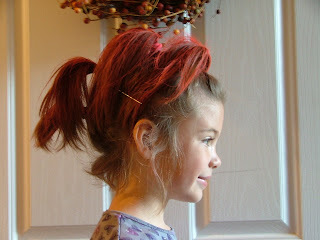 Today was crazy hair day, and you will see how we did her hair for the occasion. I had red hair spray from Halloween last year when she was Princess Fiona from Shrek, so we used it today to help make her hair even crazier. She was proud as she got to school today. She really gets into spirit week, and she already has her attire for tomorrow picked out for "Crazy mix-match hat day." I am not sure if that means you wear a crazy hat, but Billie seems to think it means you wear crazy mix-matched clothes and also you wear a hat, so that is what she has planned. I will try to catch a picture of it and get it posted for you, too. I guess that about catches you up on the fun we have had over the last several days. 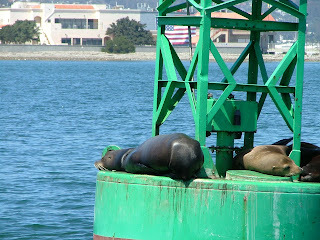 We are looking forward to a slower-paced rest of the week/weekend. Matt and I are both fighting a cold or something and we feel awful. Hopefully Billie will escape it this time, especially since she just had something herself a few weeks ago. I have decided to share a dream with you all. I hope you get as much enjoyment out of the story as Matt and I did. Not a dream like "I have a Dream," but an actual dream I had one night last week. Usually I do not get to have good dreams, usually they are awful scary nightmares, but one night last week I had babies on my mind and I got to dream about ours. 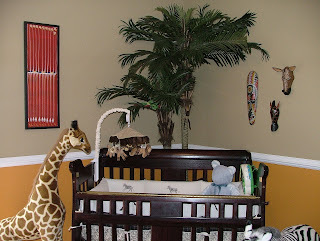 I was walking up to a crib and I saw Joshua and Caleb laying in it. I thought to myself, "I must be in Heaven. God is letting me visit the boys!" As I walked up to the crib, I could hear Caleb thinking. I know that sounds weird, but they were their correct age, about 3 1/2 months old, and they couldn't talk. But I could hear him think, and I just knew it was Caleb and he thought "OH! There is Mommy. I hope she picks us both up!" I said or thought back to him, (I am not sure if I talked or just thought, to be honest) "Of course I am going to pick you both up!" I picked them up, and they were still conjoined. They laughed and cooed and smiled and kicked and wiggled their arms. They were so sweat and the smelled so good. Yes, I could actually smell them. I held them for a while and then I decided to give them a bath. I do not know why I decided to give them a bath, maybe just because it is something intimate that you do for your children and for people you love and take care of, and it is something I never got to do for them. But they were clean, they smelled so good! They loved their bath and were very happy splashing in the water. I never heard Joshua "thinking" but I always heard Caleb's thoughts. I can't remember exactly what he said except for that first thing, but as my time with them went on I remember realizing he didn't know they were conjoined, but he had a deep desire to always be with Joshua, and he would think things that gave me that impression. After I wrapped them in a towel, I woke up. I did shed a few tears when I woke up, but they were happy tears. I really felt like I had been with our babies. It was a wonderful miracle to me. I couldn't wait to tell Matt all about it, and he has had me repeat the story to him more than once because he enjoyed it so much, too. I have thought about that dream so much ever since that night. I was so lucky to get to feel so close to them. I wish I could have that dream every night, but it might not seem so special, I guess. It felt so real and it left me with such a peace. When I think about it, I think God gave it to me. I don't think I was really in Heaven or anything, but I do think God gave me that dream. It was better than anything my mind could have thought up. I feel like I have this unique understanding of how our boys think of us, and how they spend their time. They were so happy to see me, but they didn't miss me and they weren't even really surprised to see me. I will leave it as that for now, if I share any more you might think I have gone completely nuts and lost my mind! I can assure you all, I am totally sane and sound of mind. I almost wasn't going to share this with anyone but Matt, but then I decided that was very selfish of me and after all you have been through with us, you deserved to share in this happiness with us. That is all for now, but know that we still covet your prayers and happy thoughts for us. We love you all, and thank you for your never ending support! WOW! We had the best experience the week of the 16th. 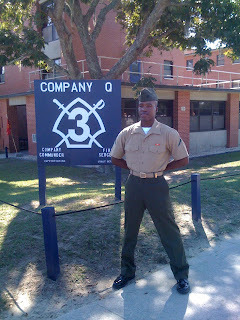 We got to go to Paris Island and see Evan graduate from basic training. I have never been to any military ceremonies before, and I really enjoyed it. Billie was so proud, too. Matt was beaming, of course! Evan is still his sweet self, making time to talk to all of us on family day, but you could tell he had done some growing up. He had 10 days leave and headed to North Carolina yesterday to begin his Infantry training. Matt talked to him yesterday and said he was excited to start his Infantry training. Our prayers are that he will not be deployed. Billie is especially worried about that. God knows best, and we will put our trust in him to watch over Evan and keep him safe. Billie made a poster and took it to school Monday to tell her friends all about the time we had with Evan and his wonderful family. She wore her shirt we bought her at the base in support of Evan's battalion. 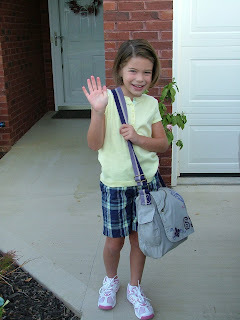 She was so excited to go to school, especially after having 11 days off! She jumped right out of bed and got dressed so quickly. We had a good week off with her, she had fall break all last week. We went to the opening day of High School Musical 3! It was a very exciting day for her, and we all had fun and enjoyed it. The movie was adorable, if not a little cheesy. We went with our friends Larisa, Caiden and Brenna. The kids especially enjoyed themselves. 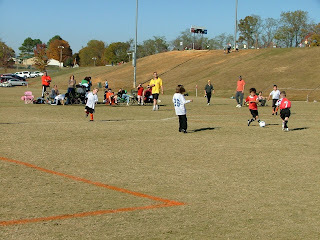 Saturday was Billie's last in-season soccer game, unfortunately it was not a win for us, but they played hard. She has a tournament in Morristown this weekend. It is her first tournament, and I just hope she makes it through the weekend. 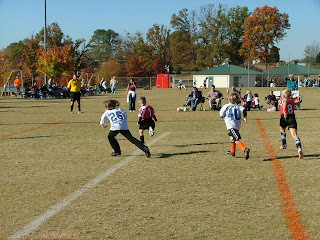 It is a lot of soccer for a 7 year old! It should be a fun weekend. We are all geared up for Halloween! Billie is going as Glenda the "Good Witch" from the Wizard of Oz. Grandma Rosecrance made her a beautiful gown! She got to wear it last Monday to fantasy week at dance. She looks so adorable in it. I will post a picture of her after Friday night. I am doing better emotionally, finally I almost feel like myself again. I am back at school and working on a class I had to take an incomplete in last semester when we were travelling for the boys. I have my schedule all worked out for the Spring semester, and will begin that in January. I am looking forward to it , all except for organic chemistry! Hopefully it won't be that bad. We will see. I feel myself coming out of that debilitating fog, though. I knew I would eventually, and I just had to be patient. We still miss Joshua and Caleb so very bad, though. Matt and I both have lots of dreams about them, most of them are not good dreams. We gave a video testimony, a very short one, for our church on Sunday. We did it together, and that was so good to do together. It did get our subconscious working though, because we both ended up with bad dreams that night. The video will be shown some time in November. It is about pain and experiencing God through pain. We only had a minute to tell our pain and how we experienced God, I had so much to say it was impossible to narrow it down to just one way. I have shared so much of how God has been with us through all of this, how God has been in control of everything and how God is so good to us. There is still so much I could and will share, eventually. We are so blessed by God. When I actually think about all God has done for us, it is truly amazing. I think working on giving that short testimony actually helped me emotionally. It forced me to really acknowledge all that God has done for us. It's not that I don't realize it daily, but I don't concentrate on it daily. I need to, obviously, because it makes me a better person. It makes me more myself, happy and healthier. It also makes me so sad for people that do not accept God and his blessings for themselves. I know I would never have made it through my life without God. How anyone makes it through hard times on their own, I do not know. God makes it so much easier, so much better, just possible even. God is Good! I will try to update again soon, but I do realize I say that at the end of like every blog and then I still go weeks in between. What can I say? I am a busy person!! I love you all and still need your prayers and support. Have a wonderful week. I am so sorry, I have done a terrible job of keeping everyone up to date on my blog. I was just looking through a history, and I had no idea I had done so little. Please forgive me, and while I will promise now to try to do better, I know it may not be possible. But, I promise I will try. We are so busy all of the time, but not a whole lot changes and there has not been that much new stuff going on. Billie keeps us going with Piano lessons, soccer practice and games, ballet class, school and church. She is busy every night of the week except Friday! But it is all fun, and she enjoys it so much. We went to Atlanta weekend before last to check on Matt's house there. We have renters that are wonderful. We just needed to check in because we had not since they moved in almost a year ago. They are fantastic, we could not ask for better renters. We are hopeful they will stay a long time, since now is not the time to sell a house. We got to spend time with our friends Greg and Leslie and their children, Keaton and Lauren. We had a nice visit, and Billie and Lauren had an excellent time together. We hope to get down there more often, and this trip was a quick one, we would rather have more time with them. On the 16th we get to go see Evan graduate from basic training. We are so excited for that. The time has passed so quickly, I can't believe it is time for him to graduate already. I am sure it has not passed as quickly for him, though. We are going to get to spend some time with him and his mom, Joan. It should be wonderful. Billie gets to miss two days of school to go, so I know she will be happy! Although, she loves school, she would rather have fun with Evan than be at school. The next week is fall break, so she will have lots of time off. We still haven't decided how we will spend her fall break, but it will be fun no matter what we do. Last year she got to go to Disney with her grandparents! Nothing like that is planned this year, but we will make it fun. As far as how we are doing, we are doing better, I think. We still have bad days, sad days, and just hard days. Yesterday we both missed Joshua and Caleb so much. I don't know why yesterday, but we did. This weekend Cathie, Matt's mom, bought all kinds of stuff to make some decorations for the cemetery, so her and Janet and I worked on them together. We ended up with two beautiful arrangements, and one amazing wreath. They looked so good, very fall-ish and she got two little teddy bears for the wreath that were adorable. It warmed our hearts and made us feel closer to our baby boys. I guess I have been angry for a few weeks now. I don't know why or where it comes from, or even who it is directed at. But I just have some anger that I am trying to deal with. I think it is just a part of the grieving process. It is just something I have to deal with. It isn't over powering, but it is there. So, I pray about it and try not to feel sorry for myself. I don't like feeling this anger, and I am going to get rid of it with God's help. It's not that I am angry at God, not at all. Like I said, I am not sure who it is at and maybe I need to figure that out before I can really get rid of it. Maybe it is just at the situation. When I figure it out, I will let you know. I promise to try harder to update you more often! Don't give up on me. 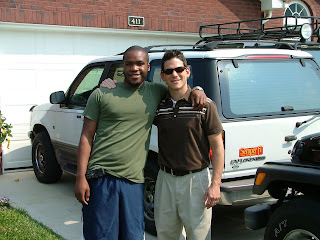 I still covet your prayers and your encouragement, and so does Matt. Hello! Let me first thank you for your support again. Thank you for your prayers and for being so happy for us and for signing the guest book. We had an amazing time in California. This will just be a short blog to catch everyone up, but I will sit down and really update you all later in the week. We did have an amazing time, and met some wonderful people out there. I got to know Matt's Aunt Nancy and Uncle Bob, and they are wonderful and precious and we had a blast with them. A HUGE thank you to both of them is needed; they gave us the opportunity for some wonderful healing between the two of us and God. I am sure eventually we would have gotten there, this place of healing that we are now in, but they made the offer of this trip at the most perfect time for us. I am sure God had something to do with that, he always knows what we need when we need it, but it took them to listen to him and extend the offer. We will always remember what Uncle Bob and Aunt Nancy gave to us. We had a wonderful time, but it was so good to get back to Billie. She is so amazing, and so brave. She did have a wonderful time and a big thank you also goes out to Greg, Kellee, Mackenzie and Courtney and to Bill and Wanda for taking such good care of our little girl while we were gone. She missed us, but had a great time, too. It was crazy getting back into the swing of things once we did get home. We had to jump right back in! It was a tiring week, but it made way for a great weekend. After church, we spent the day Sunday playing and having a wonderful family day. Billie learned how to ride her bike with out training wheels! She has always been so scared to do it, but the day finally came when we all decided it was just time. She did so good and made us so very proud. I will load some pictures of the big event later in the week, as well. That is about it. I just wanted everyone to know we are back home, and much better, stronger and healthier than when we left. We both feel closer to God and to each other. I couldn't have asked for more than what we got out of it. God is SO GOOD! Love to all!! 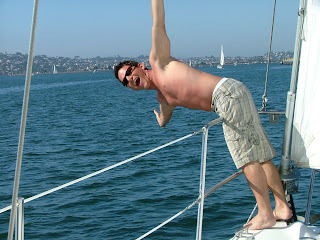 Matt and I are actually in San Diego on a sail boat with his Uncle Bob and Aunt Nancy, and having a wonderful time. They offered to let us come out and get away, and we took them up on it. We flew out here on Monday. 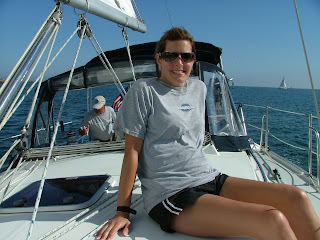 We sailed the harbor Tuesday, and took a longer sail out to sea today to see how I would feel. 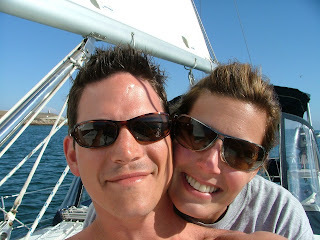 Tomorrow we leave early in the morning for Oceanside, and then Newport and finally Catalina Island! So far so good, as far as sea sickness for me. Matt has sailed before with them, but I never have and with my trouble getting car sick all the time, I was very nervous. I did fine going out, but coming back the wind changed and I didn’t do as well. But, I recovered and I know to take my meds tomorrow morning first thing! We set sail at 6:30 am. I am excited, and thankful and a little nervous. I like sailing, though. It is slow and relaxing. Peaceful and serene. God feels close, and so do our boys. Matt said today he keeps drawing them in his head. I hope he will draw them one day, I am sure he could draw them even more beautiful then they were. I see them in my dreams, and they are so sweet and happy. It is hard to believe it has been over 7 weeks now since I held them in my arms and kissed their soft skin. But it has been, and I am still here and I am still surviving. In fact, I am more than surviving. I am doing much better than I was a couple weeks ago. This trip is for us, to spend time together as a couple and have no stress on us. Just concentrate on loving each other and relaxing. To get away from the constant reminders. But what is so wonderful is that we see what God has made all around us, and that reminds us that he also made our boys, his boys. So perfect and in his image and for his purpose. We are so blessed by what they have brought to our lives. I would not have done it any differently than we did it. There is still part of me that day dreams about taking care of them , hearing them cry and seeing them smile, but I wouldn’t take them from God for all of the money in the world. It wasn’t meant to be that way, that was not part of God’s plan. What we wanted all along was God’s will, and that is what happened. I guess it would have happened that way no matter what, but it all felt right and has left an inner peace somewhere deep down in my heart that tells me everything is right and the way it should be. I will try to post another update if I can while we are out here. I included a few pictures from our sail today, so enjoy them! Most of you will be receiving something from us this week, and we hope you enjoy the pictures of the beautiful Joshua and Caleb. We had a hard time picking a few out, they are all so good!! LOVE YOU ALL!! I guess you all have figured out, when I am quiet it means I am not doing very well. I am feeling better today, though, so I wanted to at least post something. I know you all check often and everyone is praying for us, and we need that so much. I just have felt very "incomplete" the last few days. I have prayed and prayed for God to take that feeling away from me. I know it will be in his time, though, not mine. But I know he will. I have asked to feel more like myself, and today I sure do. So I still feel God with us, and I still feel the prayers of others for us. I just feel like I have empty arms. Everything I am feeling is totally normal, I just let it take over for a couple days. But not today. I just miss my baby boys. I can't help that, and I wouldn't have it any other way. Missing them this much just shows me how much I really did love them. That makes me lucky. They are so beautiful and sweet and strong. I wouldn't change what happened because I know it all happened exactly the way God planned it. God doesn't make mistakes, and my boys are no exception. They are actually God's boys, just like all children are. He honored me with being their mother here on Earth, but they were his from the start. I wouldn't take them away from God now, because I know they do not hurt and can not be hurt. I could not have done that for them here. How awesome it must be to be in the presence of Jesus! I can picture them being held by the loving arms of Jesus, and I see sweet smiles on their beautiful faces. I imagine Jesus reflection on them, his amazing glow casting light on their smiling faces. It is a beautiful image in my mind. I see that today, and I am holding on to it for the rest of my days because it has lightened my load and made me feel more whole than I did yesterday. I still miss them, but at least I see them happy and with Him. How could I wish for anything else for my children? To be in heaven with the Lord is all we could ever want for our children, and I do not have to worry about them any more. So today I will hold on to that, and let my mind imagine the perfect place they are in with our heavnly Father and allow that to make me feel less incomplete. I have no doubt that my prayers have been answered today and that image is from God. God is Good! I am sorry I haven't updated in so long. Honestly, I have been struggling and I am sure all of you are not surprised by that. I feel much stronger today, finally. But I know that may not be the case tomorrow. I really plan on continuing the blogging as it is very therapeutic for me, and I know a lot of you like to get the updates. I will try not to wait so long next time. I just have gotten very sad over the past couple weeks, and did not have the energy to write about it. Billie is back in school, and LOVING it! She loves her teacher, and it is such a wonderful blessing. We have been so fortunate to have great teachers every year. She was so sweet this morning; on our way to school she said "OH! I can't wait to see Ms. Merryman!" I asked her why and she said because she is so nice and she loves her so much. This is only day 5 of the year! I am looking forward to another wonderful school year. Everything has started this week, dance, piano, soccer and choir at church. That is helpful for me to keep me busy. It is nice to have things we have to do again. I am healing so good now. I am able to go for short walks and I am driving again. I still get very worn out after a few hours of activities, so I have to pace myself and remind myself that I did just have surgery a month ago. I am able to do some household chores again, too, and I know Matt is SO happy about it! Bless his heart, he never complained one time, but he is so thankful for the help now. I won't be scrubbing floors any time soon, but dishes and laundry are easy for me to take care of now. Since that's what piles up quickly, it is a blessing that I am able to keep up with it again. Emotionally we are healing, but it is something that is going to take time. Joshua and Caleb have changed us forever. I am a different person today because of them and they will always be a part of our family. We miss them so much, and sometimes that completely takes over. In our minds they were so perfect and beautiful, but if we remind ourselves that they would have suffered pain if they had lived longer, we are comforted by the fact that they are with Jesus now and not suffering at all. They would be one month old today. I am so thankful to God that they did not suffer or know pain. God is good and he took care of them and us. He blessed us with precious time, the exact right amount of time for his perfect plan. I know as perfect as we see them, God sees them even more perfect and loves them even more. As I said before, I will try to blog regularly and not let another two weeks go by with out updating you again. We still get cards and I know there are so many of you that continue to pray for us. Thank you all for your loving support, it means so much to us and helps us get through each day. We are so blessed to have loving friends and family, and I thank God for you every day.
" Praise be to the God and Father of our Lord Jesus Christ! In his great mercy he has given us new birth into a living hope through the resurrection of Jesus Christ from the dead, and into an inheritance that can never perish, spoil or fade-kept in heaven for you, who through faith are shielded by God's power until the coming of the salvation that is ready to be revealed in the last time. In this you greatly rejoice, though now for a little while you may have had to suffer grief in all kinds of trials. These have come so that your faith-of greater worth than gold, which perishes even though refined by fire-may be proved genuine and may result in praise, glory and honor when Jesus Christ is revealed. Though you have not seen him, you love him; and even though you do not see him now, you believe in him and are filled with an inexpressible and glorious joy, for you are receiving the goal of your faith, the salvation of your souls. Concerning this salvation, the prophets, who spoke of the grace that was to come to you, searched intently and with the greatest care, trying to find out the time and circumstances to which the Spirit of Christ in them was pointing when he predicted the sufferings of Christ and the glories that that would follow. It was revealed to them that they were not serving themselves but you. when they spoke of the things that have now been told you by those who have preached the gospel to you by the Holy Spirit sent from heaven. Even angels long to look into these things. Therefore, prepare your minds for action; be self-controlled;set your hope fully on the grace to be given you when Jesus Christ is revealed. As obedient children, do not conform to the evil desires you had when you lived in ignorance. But just as he who called you is holy, so be holy in all you do, for it is written: 'Be holy, because I am holy." God is good, and I was able to say that yesterday morning and this morning, just as I said I would. I said it out loud to Billie, and explained myself to her before I sat down and read the passage above in my bible. Maybe that is why I felt God was pleased with me, and he let me know. I am trying not to ask "Why," even though that is very hard not to ask. We wanted God's will from the beginning, and I feel confident that is what we got. I want to be satisfied with that, but I think that will take some time to really feel. Once I have gotten through some of this over whelming grief, then I will truly be able to see God's will and how it touched our lives. I can tell you this, the "Peace that passes all understanding" is a real thing. You feel it in your bones, and it is a beautiful feeling. I can't wait for the day I get to feel it again. I will keep reading and praying and believing so that I do have it again. I hope everyone gets to feel that at some point in their lives. I never could comprehend what that meant until yesterday. It is beautiful. I haven't had a lot to say in the last five days. Well, that is not exactly true. I was always taught if you have nothing nice to say, say nothing at all, so I have been silent. Even knowing that God is with us and that his will was done, I found myself completely taken over by my grief in the last five days. I know Matt feels the same way, too. We are leaning on each other, though, and are drawn closer by our grief for which I am so thankful to God for. Today our boys would be two weeks old. By now we would know their personalities well; which was more fussy and demanding, which was the good eater, and which really needed his sleep. I miss all that comes with having a baby, and I miss it twice as much. It is amazing that I had identical twins! When I step back and try to wrap my mind around it I find it so hard to believe and even understand. I never thought I would have twins. They blessed my life so much and completely changed me forever. I am so lucky to have experienced our Miracle Twin Boys. I think I will like the woman they made me better than the woman I was. Let's hope everyone else does, too! I know they have made me more thankful to God for every thing and every one. I see things differently, through different eyes. Eyes that are not only more thankful, but more wise, strong, sad and loving. I am not even sure that anyone can understand what I mean unless you have been where we have been. This experience was so different from anything I have ever been through before. Pregnancy the first time brought me such joy and honor. I felt more beautiful and closer to God. I felt so very honored that He found me good enough to bless me with a baby. With Joshua and Caleb I still felt so blessed each time they kicked, and they did a TON of kicking! I also felt so scared and I would pray to God to let them stay where they were forever because I knew they were safe there. I would gladly have stayed pregnant for the rest of my life, just to keep them safe and with us. I also would tell the boys to stay where they were; that as much as I wanted to meet them it wasn't yet time and I needed them to be happy with their current home so that I could keep them safe. The day I went into labor, I knew there was no stopping it and I no longer prayed for that. I instantly went into praying for strength and peace and for God's will. God prepared me for that day, and I was at a place of acceptance. I am so blessed by God that he gave me that. I do admit that over the past two weeks I have begged him to change it, to give us our boys back. Of course, I knew that would not be possible. I knew the second my boys were in heaven and I have always known you do not come back from heaven. I really do not want to take heaven away from my boys, either. But the mommy in me misses them and longs to hold them and love them and take care of them. I can't stop that instinct, and I do not want to. This is just something that I have to work through. So I find myself this morning reading my bible and praying again for strength and peace. I have prayed for that before and He answered my prayers then and He will now, too. It will be in His time, though. After I have learned all from this that he wants me to learn. I am open to the lesson, although I am scared. It can't be worse than what I have already been through, I just hope it isn't to get me ready for some other, bigger challenge. I really do not want to go through anything harder or sadder, and that is what I am scared about. People always say "this is to make you stronger," and to that I have to ask "FOR WHAT?" Are you kidding me? If I have to go through something bigger than this, than my first thought is "I quit!" But the truth is, I know I will not quit. I know God will see me through as he has everything. He is Good and he always carries me through. He has a wonderful plan for me and my family, and I am excited to see that plan. He has blessed us so much, and I am so thankful for my three beautiful children and my wonderful husband. I will always remember that, even when I am in my darkest mood. I know that I do not need my own strength, only the strength that God gives me. I will not try to be strong, but I will let God be strong for me. "It is God who arms me with strength and makes my way perfect. He makes my feet like the feet of a deer; he enables me to stand on the heights. He trains my hands for battle; my arms can bend a bow of bronze. You give me your shield of victory, and your right hand sustains me; you stoop down to make me great. You broaden the path beneath me, so that my ankles do not turn." Psalm 19:32-36 This passage gave me strength this morning. God helped me find it so that he could strengthen me this morning because he knew I needed it. Every day for the rest of my life I will say "God is GOOD." I will say it and I will mean it and I will believe it and I will hold on to it deep down in my heart. God has done so much for me through my whole life and I want to acknowledge this every day so that I will not forget even for a second how GOOD God really is to me. We both woke up this morning feeling so empty. I guess it was good to have something to plan and busy ourselves with over the last few days. This morning we had to face it more. I am sure tomorrow will be even more so. I don't know what to think about this morning's service, and I am scared for it. I know God will get us through it, though, like he did last night. If you were there last night, then you know how amazing it was. It was even better than I had imagined it would be. Dr. Crocker did a wonderful job, he is so fantastic. He says exactly what is on his heart and he is not afraid and I love that about him, and I miss hearing him on a regular basis so bad. He has supported us every step of the way through this, and he is so dear to both of our hearts. 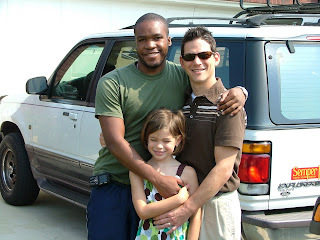 He married us, so I am sure that puts him in a special place by itself, but he always calls us and comes by to see us. Whenever we felt like we were faced with a decision, he would come over and let us talk it out. We kept him here many late nights, we are both LONG WINDED! I suppose it did not bother him too bad, because he kept coming back for more every time we needed him. You thanked us last night, David, but we really need to thank you. We also want to to thank the choir. We were absolutely blown away when we walked in and saw a full choir. The song was beautiful and it was so good to have you leading us in the other songs. Dr. Bill Davis was wonderful, too. I kept thinking as I was standing there that it didn't even feel like we were at a funeral. If the casket had not been in the front of the room, I could have told myself we weren't at a funeral and I would have believed it. I was so scared when we started last night, I was trembling in fear. I have only done that a few times in my life, the most recent being going into the surgery on the 15th. It always surprises me when I do that, tremble in fear. Usually it is when I have not even been aware that I was so scared. The same was last night. This is a much different feeling than being nervous. I know how that feels, and while I don't feel that often, I always recognize it. You know, the butterflies in your tummy kind of feeling. Little things can bring that on; speaking in front of a crowd, meeting new people, things like that. This was different and it comes from deep inside me, a place that I don't usually let open, and I really can not control it once it is open. It is always the unknown that opens it. I had no idea how that surgery was going to end, either with how my body would end up and what would happen to my precious babies. Last night was no different, I had never experienced the funeral of my children and I was terrified. I ended up being so comforted by the end, and I felt so much better when we left last night. The service was exactly how we wanted it - we wanted everyone in attendance to understand "To God be the Glory," and that God is our Father; he wants to take care of us. He hurts when we hurt, and I found myself able to remember that as I sat there watching the slide shows of that miraculous day I held my sweet babies. I am sure it was God that was telling me he hated to see me cry. I know he is also hurting watching Matt and I and our families grieve for the babies we loved so much. The slide shows were so perfect. Our friends Joe and Leatha made the first one for us and we want to thank them, as well. It was so beautiful. Matt and I didn't watch it before last night, we wanted to see it in the moment and not spoil it. We are so blessed to have such good friends all around us. We have so many people taking such good care of us all of the time, and we felt that last night. The second slide show our friend Nancy made for us, she is a photographer and we met her last year when she photographed our wedding. She went above and beyond for our special day, and we became friends during that time. She was gracious enough to agree to help us capture our memories with our boys. She was on call ever since we found out we had conjoined twins. The beautiful prints you saw last night were also hers. We love her work and we knew she would give us what we needed of that day. She went above and beyond for us again, and we love her so much for that. She had a friend, Erin, that came with her and helped her capture so some of the pictures are also Erin's. I want to make sure they both get the credit they deserve for our beautiful portraits. The songs we picked for each slide show are also special to us. Roger, our anesthesiologist, played the Jack Johnson Curious George soundtrack during our surgery so we used several songs from that cd. We can remember each of them playing during the surgery, but they also have wonderful meaning in their word's. The other song we chose was by Sarah Groves and it was called "Song for My Sons." Ann, a nurse from the NICU, gave us the cd. We sat down to listen to it and I was blown away at lyrics. It is like she crawled into my mind and wrote the song. It is perfect for my sons. I love it, and ever since the slide show last night it has played in my thoughts nonstop. It is time to get ready for the service, and I am scared again today. I know God will get us through today, and the next day, and the next. God is GOOD, he has a plan for our lives just like he did for Joshua and Caleb and I will not allow myself to doubt that, even in my grief and sadness and emptiness. I know God will hold us today and give us the strength to do what we have no choice but to do. I know this hardly compares, but we have found ourselves comparing this to God losing Jesus. We were talking about that yesterday, that he knows our pain first hand because he lost his son, too. But the difference is God is in control of this, as he was with Jesus. HE could have backed out, but he didn't. If we were in control of this we would have backed out long ago. I don't understand how he was able to go through with it, but that is just one of the many things I can not comprehend of our Father. He is so great, so greater than I can even comprehend. 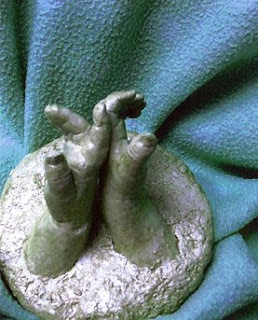 The picture here is of the mold of the boys' hands that Ann, one of our NICU nurses, gave us. She and some of the other nurses spent hours making these and they took us by such surprise when she gave them to us. We knew they had made them, of course, but we had no expectations in our heads of what they would look like. We were so empty after losing the boys and we longed to hold them and kiss them just one more time. These molds helped ease the longing a little, they filled a part of that emptiness we had been feeling. We will treasure them always, thank you to Ann and everyone that helped to make them. They are irreplaceable. 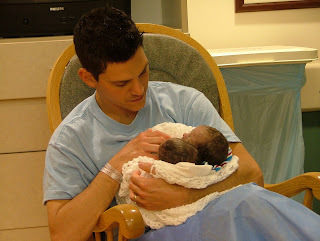 I wanted to share this picture, you can see Caleb looking at his Daddy. It is one of my favorites. Isn't it beautiful? Both Joshua and Caleb must have recognized their Daddy's voice, because you can see their eyes turn to the sound of it, each at a separate time. First of all, please let us thank you for your prayers and support once again. The guestbook has been busy, and that warms our hearts so much. We are also getting lots of cards through the mail and it lifts us up and helps us face everything we are having to face. I can tell you this has been the most emotional week we have had in our lives, and I am sure tomorrow will prove the worst of all. As hard as all of this has been, it has been cleansing, too. I am not sure which was harder, buying the cemetery space or writing the obituary. Each day I thought that I wouldn't make it through, but some how in the night I grew stronger and felt more at peace with the dawn of the new morning. God is so amazing and we feel him with us through every step of this process. We yearn for our babies, though. I miss them from this place deep in my soul that I didn't even know was there. I know from experience that I will learn to live with this emptiness and it will feel further away from me as time passes. I can't decide if I want that day to hurry and get here or if I just want it to wait because that puts me further away from the day I held my baby boys. You can not imagine, or maybe you can if you have babies of your own, the wonderful feeling of holding those two boys in my arms. They were warm and tiny and so sweet. When I close my eyes I see their faces, their beautiful faces. Matt sees the same thing. We find comfort in their nursery, praise God for that. It is still the prettiest room in our house! Although Billies room is a close second. I am sure many of you are wondering how Billie is doing, and you can rest assured that she is doing good. She is the most amazing 7 year old that has ever been, if you ask me and I realize I am biased. She has her moments when she is sad and she misses her brothers, but like any 7 year old she wants to eat ice cream and watch TV and go swimming. She is very worried about Matt and I, and she is able to show her concern. We have let her go with friends and family so she can get away from the constant sorrow that is around us most of the time. I talked to her on the phone last night before she went to bed and she asked me how I was feeling and then she said " I am so glad that tomorrow is Tuesday and you get to get your staples out. I know that you will feel better and walk better when the doctor takes those out." I asked her how she knew and she said that I had told her and she had been counting down the days since then. She was so excited when I told her I had been to the doctor's yesterday and they decided to take my staples out early. Her reaction was priceless and it wasn't so much the words but the true relief in her sweet little voice. God continues to bless us through Billie and we are so thankful for her. Is it aught to Him? Does He see? I know my Savior Cares." I know there are so many out there who have also lost babies and know the pain we are going through. I guess it is true that misery loves company, because knowing this about my aunt instantly gave me this feeling of a tighter bond with her and it was like Jesus tied our hearts together with a string because, although my heart ached knowing that she knew my pain, it was also comforted that there had been someone dear to me that had been through this and survived. Knowing that she was able to live through this pain and be OK helped us last night. No one should have to feel this pain, it just isn't fair. I know that God was protecting us, though, in not allowing us to take our babies home. As much as we thought we wanted and needed that, it would have made this a hundred times harder. The more time we had with them, the more we would have wanted. No time would have been enough for us. My heart breaks for all of those parents who have lost not babies but their children. That pain has to be so unbearable, I can not even imagine. As much as our loss hurts, that would be worse. We count our blessings and we are able to see that God is good and is watching over us and taking such good care of us. For those who do not know, the receiving of friends will be at Central Baptist Church of Fountain City Wednesday, July 23, 2008 from 6 PM to 8 PM with the funeral service immediately following. The graveside service will be Thursday, July 24, 2008 at 11 AM at Lynnhurst Cemetery. They are miracle twin boys. Where do I begin today? 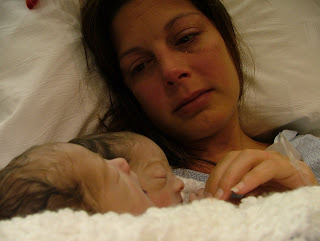 It is with a heavy heart that I share with you the news of our two beautiful miracles. They were such a blessing to us and we want everyone to know that. They were perfect. They lived for about an hour and a half. We got to hold them for twenty minutes while they were still living. Those twenty minutes were the most precious twenty minutes we have ever experienced. Joshua was born first, he was delivered head first while Caleb was born about 30-45 seconds later breach, figure that one out!! The doctor did struggle to get them out, but the surgery could not have gone better. We do not know the exact second their heart stopped beating, but I do think Caleb passed a few minutes before Joshua did. A mother knows, that is the only way to explain it. They were so peaceful the entire time. They did not have mature lungs, and they didn't have enough lung capacity to survive. They did try very hard though, and the doctors and nurses from the NICU did everything they could for our boys. God blessed us with what time we did have. As much as we love them, we know God loves them even more and now they are two boys living and breathing with Jesus. God our father is holding us through this and we feel his love and we know that he did what was best for us and for Joshua and Caleb. We have some beautiful photographs that our photographer came and captured and we will share those with you later. We did want to give you something, so the pictures here we took of each other during our time with the boys. We kept them with us until early Wednesday morning. Billie came and saw them and was so brave and sweet. She was able to kiss them and touch them and tell them good bye. We could not have been more proud of the way she handled herself. I know everyone is wondering about a service, and we just haven't been able to think about that yet. We will update here as soon as we have made arrangements, but that will not be for a few more days. I have to heal some physically, and we both need to prepare ourselves emotionally before we tackle that. Know that we are loving each other through this. We miss our babies so much but we know that they are with Jesus and they are precious in His sight. They were God's children before they were ours. The most important thing you could want as a parent for your children is a relationship with God. Our boys not only know God but they are with him. We imagine him rocking them and bouncing them on his knee. If it were not for God, we could not do this. We asked him to hold us through this and he has and he is. We are very blessed by God and we are very thankful to Him for the gift he gave us. In the beginning we said we just wanted to hold them alive, if even for a few minutes, and God allowed us that time. We will forever hold that memory in our hearts. Together we share a memory of the best twenty minutes of our lives and no one can ever take that away from us. We know what it felt like to be the parents of Joshua and Caleb. We are blessed by God. Sunday morning Matt mentioned he would like to visit Cokesbury United Methodist that morning if I was up to it. I think it was the first thing out of his mouth when he woke up, actually. I was up to it so we got ready and went. I am convinced God wanted us there that morning to hear the message. They also had the Lord's Supper and we got to do that together and pray together. It was a very emotional morning for us, exhausting actually, but it has stuck with all three of us. I am so thankful we were there. I want to share with you what I learned from the sermon. I hope I do not butcher it too bad! The message was from 2 Corinthians 12:7- 10, and it reads: "To keep me from becoming conceited because of these surpassingly great revelations, there was given me a thorn in my flesh, a messenger of Satan, to torment me. Three times I pleaded with the Lord to take it away from me. But he said to me, "My grace is sufficient for you, for my power is made perfect in weakness." Therefore I will boast all the more gladly about my weaknesses, so that Christ's power may rest on me. That is why, for Christ's sake, I delight in weaknesses, in insults, in hardships, in persecutions, in difficulties. For when I am weak, then I am strong." I am sure you have seen the visa commercial with the runner from the '96 Olympics that was hurt in the middle of his race and his father runs down on the track and carries his son across the finish line. 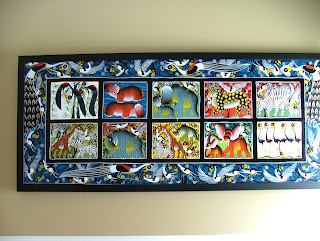 The minister used the story here to explain how God, as our father, wants to do that for us. He is strongest when we are weakest. I realized sitting there that I am at my weakest, my situation has beaten me, but I go on every day because God is carrying me through. God is so strong, and his love for us is all around us. I completely feel in the presence of God, and I completely feel his hands on my life, on my family and on my miracle twin boys. No matter the outcome, I know that God will get me through this. I can not imagine what it will be like to hold these boys, to meet them face to face and finally lay my eyes on them. I can not imagine what it will be like if I also have to give them up. It seems like an impossible task, especially after feeling them move inside of me for the past several months. I know that it is a real possibility, though, and as much as I hate it and dread it, I know that God will carry me through it, as he always has. God is my "Dad" that wants to protect me from hurting, wants to take my burdens and carry them for me. I just have to let him. He wants to do that for all of his children, and it is so amazing that he can and he does. Needless to say, it was a humbling experience for Matt and I, and I am so thankful for the powerful message that was needed to be heard by us, and for God getting us there that morning, too. He has a plan, and it is so GOOD. Billie also got a lot out of the message, she shared it with us later that night. It is funny how you can hear the same thing, but get a totally different lesson out of it. The message was titled "Life is Too Short- To Give Up" and it was when she was saying her prayers that night that she asked God to let the minister know "that he is wrong, that life is not short as long as you believe in Jesus you will have eternal life." It was precious, and we were impressed that she had been listening. She is getting so big, and she is such a blessing to us in so many ways. God gets to us through her a lot, and it is so powerful. OK, I hope I gave that the justice it deserved. Moving on to our doctor's visit on Monday. I didn't gain any weight, which I thought very exciting! I did grow 2cm more, however. The boys heart beat was back up to 128bpm. They are head down, which is much more comfortable on me, and they are hiding their faces, for the most part. 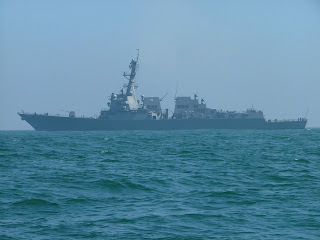 We did get a picture of one of them, and I will try to get it up this week for you. I do not know whose face it is, but since they are identical, I guess it doesn't really matter! I went in with a missing voice and not feeling very well from a sore throat, and they gave me some meds and "tickled my throat" ( as Billie calls it), but the strep test came back negative. I am finally feeling and sounding much better today. Overall, not much has changed and it was once again a very good visit. We will go again on Tuesday and hopefully get some more information as far as delivery and dates. It is still bothering us that our doctors do not agree on how to do the c-section so we have requested that they get together and work out a plan and then sit down with us on Tuesday and go over it with us. I am so anxious about delivery, after all this is surgery, and the fact that they do not agree is just too much on me. I know things may change once they begin and see what they are facing, but I need a tentative plan that they can all agree on. And since we will be 34 weeks, we feel it is time to get some kind of a date nailed down. We are both planners, so it will just give us a little feeling of control, and that will be comforting. It probably will not matter what we plan, God's in control of this as he has been from the start, so we are only kidding ourselves with a date! 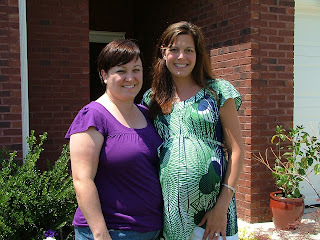 I wanted to share these pictures of our visit with Kelly Wells and Evan. We enjoyed the company of each of them so much. Evan was here for a few days and on his last day here Kelly got here and the two of them were able to meet each other, so that was fun for us to share the two of them. I have always been so close to Kelly, and it was so good for Matt and her to finally get to know each other. Kelly helped take care of me, and gave Matt some good time off so he could concentrate a little more on work. We all enjoyed Evan's company, as well. He is such a fine young man, and we are so proud of him. This bear was given to us by The Center for Unlimited Possibilities. It was part of lots of prayers specifically prayed for us and the boys. In the letter that came with the love bear it said "All bears have been donated to The Center with the realization that love "beareth" all things." Julie and Bob brought us the bear, they are cousins of Kent Merrill, who is another friend of Brian and Cathie's. We were not able to meet with Julie and Bob when they visited, but Brian and Cathie were able to and they all prayed together with the Love Bear for us. Many thanks to all of you, and we will always cherish our love bear. This was about a week ago, I love to be in the water. I feel so good, no contractions, no back ache, no swelling-it's a beautiful thing. So we went to Grandma and Grandpa's late in the afternoon and then we all went out to eat for dinner. 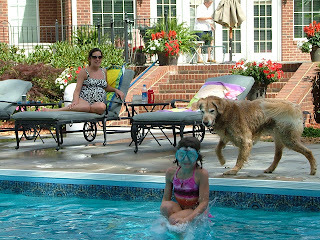 Billie worked on her cannon ball, and Dexter (the dog) was very playful. 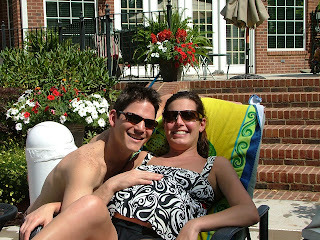 Matt insisted on showing everyone my GIANT belly, sorry if it offends anyone! 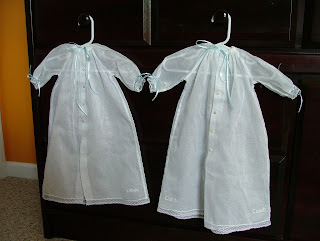 These gowns were created by Serena Crowder, a friend of Cathie and Brian's. They are absolutely perfect, exactly as I envisioned them in my head. 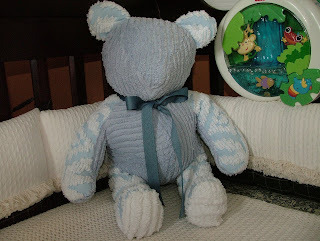 They have little blue ribbons at the neck and wrists, and the boy's names are embroidered on them, as well, at the bottom. If you are wondering how they will work, they will button to each other once they are slipped on each boy. The material was donated by Teresa and Steve Smith, who knew Matt as a member of the youth from church when he was younger. I can hardly wait to see the boys in the beautiful gowns, we will definitely share pictures of that with you all! 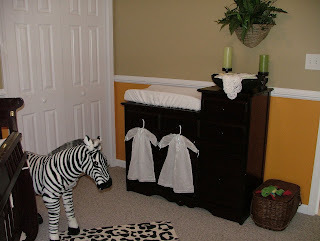 Ok, so I promised pictures of the nursery once we got the finishing touches on it, so here they are. While I was at it, I figured I should post some others as well, so there are a few from the last few weeks of different fun things we have gotten to do, just to catch everyone up. I hope everyone had a good 4th. We spent it at home, I wasn't feeling well and Matt had to work. Dave went grocery shopping for us and then stayed for the evening and we all had steak and salad and a very good time. Enjoy the pictures and have a very good weekend. begins to flourish, in a water cocoon (9 months) they will dwell. a “perfect” little person(s) will emerge. Ultrasounds offering clues. The key word here is perfect but Who makes this call? Society tries to determine, however GOD knows more than us all. doesn’t single out a race, or a gender, country or religion. I believe that GOD loves us all and sees the beauty in our souls. We are all graced by HIS touch and our true hearts HE always knows. and rest assured he is always watching from Heaven above. but painful journey’s sometimes await along life’s road on both sides. but the fear is replaced by “HOPE” when the morning light again appears.GOD is our true light and for these twins HE has a plan,as HIS shepherds, even as small as they are they are a blessing to “MAN”.Joshua and Caleb will rely on each other, joined together on this earth like God intends mankind to be joined with HIM beginning at our birth.We are not promised a given time of how long our earthly bodies will stay,but when we accept GOD’s loving grace our SOULS continue on to their final Eternal place.We can share in the joy, and the happiness of whatever time that GOD give us, and marvel in GOD’s blessings, and his path for man thru his BELOVED Son “ JESUS”. Thank you, Betty. We will treasure it always. We had a wonderful day today as a family. Matt worked this morning, but then he took a break and took us to lunch and we all just relaxed and had fun enjoying each other's company. After we got home it was back to work for Matt, but Billie and I plopped ourselves on the couch and cuddled and watched TV together for a while. We all needed some good quality time together, and it put us all three in wonderful moods. Billie spent last week in Johnson City with her Grandma and Grandpa Rosecrance and her cousin Chandler swimming in the lake and riding horses. She came home for two days and then went to spend two nights with her Grandma and Grandpa and her cousins Riley and Mallory swimming and going to movies. It is so nice to have her back home and with us again, we really missed her but we are glad she was able to spend time with her Grandparents and have some good summer fun, too. It is amazing to think they only have a little more than a month before school starts again!